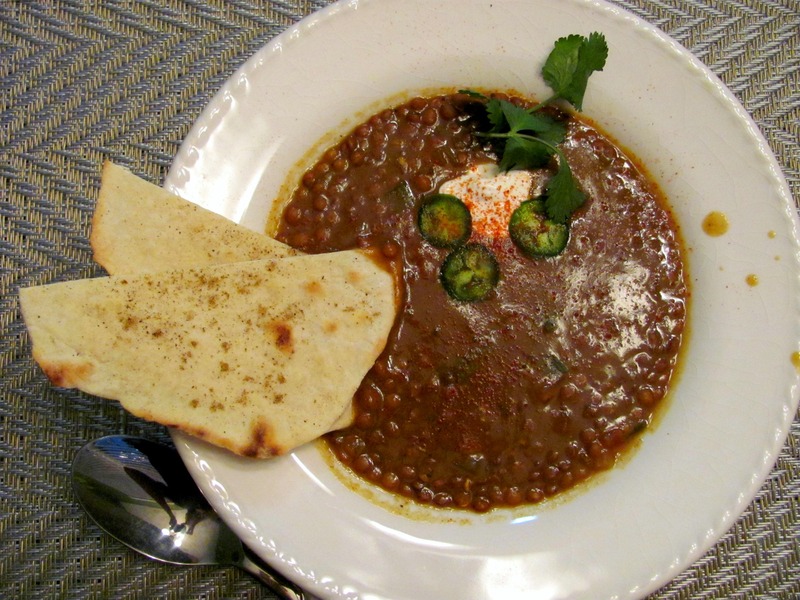 This soup has an absolutely wonderful flavor and is fantastic served with Indian roti bread. I don’t normally make too many crockpot meals, but I am warming up to the idea of doing it more often since it requires minimal effort and allows for efficient batch-cooking. Today, I wanted to use up the rest of my black lentils (yay plant protein!) and make something my husband and I can eat all week. He is actually here and not on the road for once, and consumes literally 3 or 4 times as much food as me. Yet he’s slim as can be…ah, men and their metabolisms! Spices, clockwise starting with lentil beans at the top: curry powder, crushed red pepper, turmeric, white pepper, coriander, ground red chili pepper. 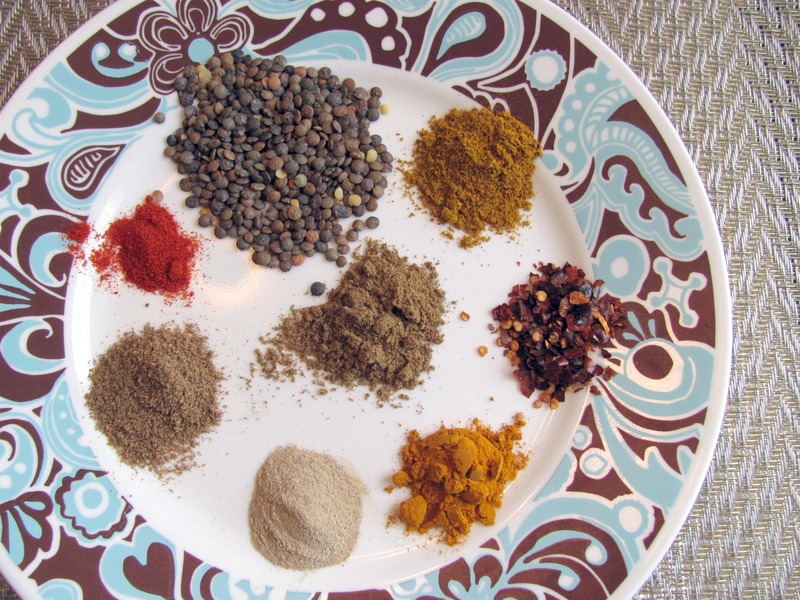 Center: cumin. Chop tomato, onion and green onion first. Place everything in the crockpot, stir it around a couple of times and turn the dial on “high” and let ‘er rip, well for 2 hours let ‘er rip on high. After 2 hours decrease to the low setting and the lentils should have absorbed all moisture and will be soft when chewed after it goes for about another 4 1/2 hours. You will know the lentils are fully cooked when they’re completely soft and do not “crunch” when chewed. I also thickened up the broth a bit by adding 1/4 cup all-purpose flour at the 2 hour mark, however I did go back and add 2 cups of water periodically. I solely did this because there’s a certain consistenc I was looking for. Once it’s done cooking, add any additional spices you wish. A dollop of vegan sour cream and a slice or two of hot chilies would probably be fabulous too. Serve with Indian roti bread, which is super easy to make too! Gorgeous! I could eat lentil soup every day. I can almost smell the spices in your photo! This is almost exactly what I’m eating this week. I cooked mine down and added mushrooms and green pepper. Yum!